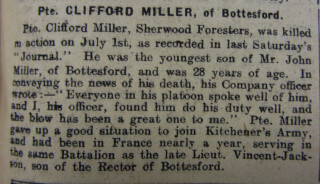 Clifford Miller was born in 1881, the youngest son of John and Mary Miller of Bottesford. John was born in Bottesford and Mary Miller in Boughton, Nottinghamshire. They had two older sons, William (born in 1878) and Francis (born in 1882). The census records the family as living on the High Street, Bottesford in 1891. Clifford’s father was employed as a farm horseman. His elder brother, William, was an apprentice butcher and Francis attended school. However, in 1891, Clifford was staying with his mother at the home of his aunt and uncle, George and Annie Burchell at Norman Street, Ilkeston. The family continued to live on the High Street and by 1901 Clifford, still at school was the only child still living at home. Clifford moved to Ilkeston to live with his aunt and uncle and by 1911 was employed as a coal hewer with the Mapperley Colliery Company. According to the Grantham Journal (22nd July 1916) Clifford joined up soon after the outbreak of war with the 11th Battalion (Sherwood Foresters) Nottinghamshire and Derbyshire Regiment. 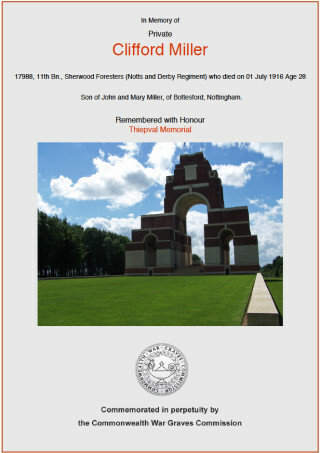 He worked for the Mapperley Colliery Company and enlisted with the 11th Battalion Sherwood Foresters at Ilkeston, Derbyshire. This Battalion was formed in Derby on the 17th September, 1914. Many of those who enlisted were miners from Nottingham and Derby. The Officers also included local men, one of whom was Montagu John Vincent-Jackson, the Bottesford Rector’s only son. Clifford and Montagu experienced the same span of service on the Western Front after an extensive period of home based training before deployment to France on the 27th August 1915. The 11th Battalion’s training took them to several camps in the south of England and was not without its difficulties. There were equipment shortages. Living under canvas the inclement weather of October and November 1915 took its toll on the health of the newly enlisted men. (Percy Freyer (1920) ‘The Men from the Greenwood’ p. 13). Spirits and circumstances improved with the move to winter quarters at Aldershot on the 2nd of December, 1914. Their subsequent training took them to a variety of camps before their posting to France in the August of 1915. Clifford Miller’s detailed army records no longer exist. However, within a month of landing in France the 11th Battalion suffered its first casualties at La Chapelle d’Armentieres. The next months brought further losses resulting from a number of actions in sectors near Armentieires and Fleubaix in northern France. Clifford Miller was one of the many men from the 11th Battalion who Percy Freyer described as maintaining ‘their cheery optimism’ under the ‘dreary’ conditions of ‘miserable mud’ as they moved in and out of the line. By the time they transferred to the Somme sector in March 1916, in preparation for the major July action, they were battle-hardened troops. Sadly, Montagu Vincent-Jackson had not survived. He lost his life after volunteering to lead a night patrol on the 5th February 1916. 737 men from the 11th Battalion went forward in the second wave of attack in that sector, 27 Officers and 710 men. Only 6 Officers and 202 men survived. Pte. Clifford Miller, aged 28, did not. The exact circumstances of his death are not known. Sadly he has no known grave. He is commemorated on the THIEPVAL MEMORIAL (Pier and Face 10C, 10D and 11A) as one of 72,194 names of men missing in action on the battlefield of the Somme. On the 2nd July Major Wilfred Swinhoe-Phelan returned and took temporary command of the Battalion. It was his duty to submit a report of the Battalion’s action. This he duly did on the 5th July 1916 thus providing a definitive account of the Battalion’s losses on that day. 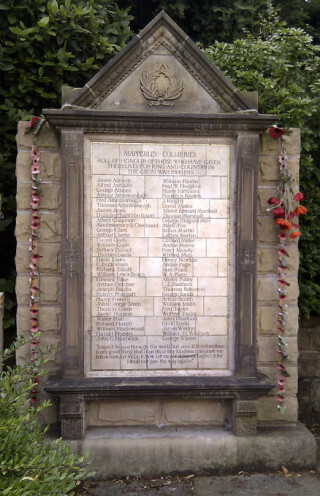 Those men from the coalfields of Nottinghamshire and Derbyshire who had volunteered to serve with their local battalion. The Battalion took over from the 70th Brigade on the evening of the 26th June, being relieved on the following evening when the Brigade took up the final position of assembly. Owing to the Attack being postponed 48 hours the Battalion again took over the front line on the evening of the 28th and held the Sector until position of assembly was taken up a second time on the evening of the 30th June. During this time our casualties were comparatively slight, although we were unfortunate in losing 3 Officers including the Medical Officer wounded, and a platoon Sgt. At 7.45 a.m. on the morning of the attack. 1st July, a message was received that the German First Line was taken, and shortly after the Battalion was ordered to take(n) over our front line vacated by the 9th York and Lancaster Regiment. This was done independently by Coys. (Companies) by pre-arranged routes, under fairly heavy shrapnel fire. It had been arranged prior to the assault that the Left Centre Company 1st Wave was to file straight out of a sap and occupy a bank about 70 yards in front of our own front line. After considerable difficulty owing to the congestion of wounded in the sap an attempt to do this was made. A very heavy machine gun fire was brought to bear on this wave from the left flank and the enemy front line which had apparently been re-occupied by use of underground galleries from the enemy 2nd line after the assaulting Battalion had passed over. The same fire was directed on the remainder of the first wave when they attempted to advance from our front line. This 2nd Wave, lead by Major G.H. Bernal, D.S.O the second in command, then pushed forward in support hoping to carry forward the 1st Wave. Casualties along the whole of the line were very heavy, and a general attempt was made to crawl forward under intense machine gun and shrapnel fire, any available cover being made use of. Headquarters, lead by Lieut.Col. H.F. Watson, D.S.O. the Commanding Officer, then advanced, only Headquarters Bombers being left to hold the trenches. Lt.Col. Watson walking diagonally across the front collecting men as he went gave a fresh impetus to the advance by his personal example, but the advance died out before the 1st line was reached Col. Watson himself and other H.Q. Officers being wounded. Another attempt to reach the German trenches by the sunken road on the right flank was made by about 80 men under Capt. C.E. Hudson, including the Battalion Bombers and details of other units collected in out line. This attempt was brought to a standstill by heavy frontal fire as they came over the brow of the hill in the last 80 yards. Casualties sustained by the Battalion during the day amounted to 21 Officers and 508 N.C.O’s and men. The strength of the Battalion on entering the trenches on the 26th June was 27 Officers and 710 men. A week later further details also appeared including part of a letter from his Company Officer to his family in Bottesford. 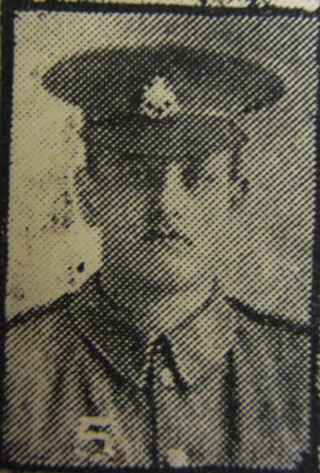 His family commemorated the anniversary of his death in The Grantham Journal on the 30th June, 1917. In loving memory of Pte. 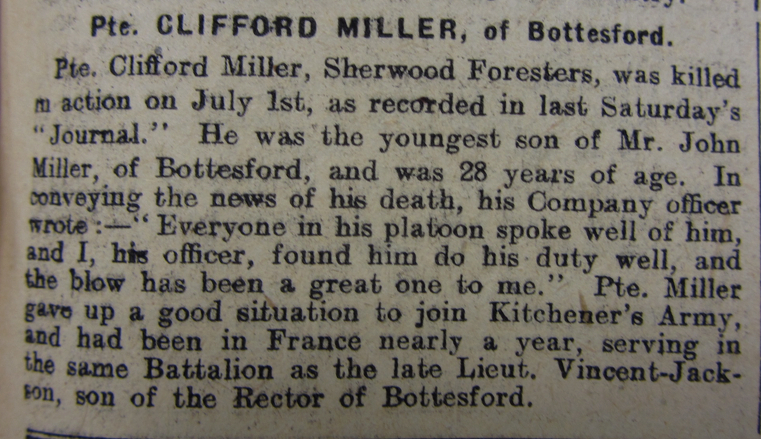 Clifford Miller, Sherwood Foresters, youngest son of Mr. and Mrs John Miller, of Bottesford, killed in action, in France, on the 1st July, 1916. Slain by the enemy’s hand. In addition to the memorial in St Mary’s Church Bottesford he is also commemorated on the The Mapperley Colliery Company War Memorial situated at the St. Wilfrid’s Church Gates, West Hallam. He is one of 66 men who worked for the company who are listed on the memorial. On Saturday July 12th 2014 all the men listed on that memorial were remembered as part of the First World War Anniversary. Relatives and friends of the men were invited to place a wreath or Poppy Cross at 1-40 p.m. This was part of the Village Well Dressing weekend. (Roger Wood, West Hallam, Derbyshire, kindly sent the above details). Pte. Jesse Norman from Muston also served with the 11th Battalion, Sherwood Foresters.